The sequel to 2008's stellar Arkham Asylum addresses one of the main complaints lobbed at the original: It was too short.. Developer Rocksteady Studios apparently listened to the entitled pleas of critics and consumers, when designing this much longer sequel. 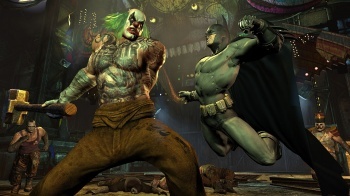 Game director Sefton Hill told The Guardian that Batman: Arkham City will feature a 25-hour campaign with an additional 15-hours of optional side-missions. Despite extending the game's story far beyond that of most contemporary action games, Hill insists the studio will continue to focus on pacing and variety to keep players interested. "To keep players engaged for this length of time, not only do the characters and the story need to progress, but the core mechanics of the game they are playing need to change and adapt as well," Hill said. "What's really rewarding is seeing the change in players by the end of the game." Back in March, we reported a story about the game's marketing manager Dax Ginn saying QA testers on the game can beat the campaign in eight hours. Perhaps they are really, really good, Batman: Arkham City has a lot of skippable cutscenes, or Hill is exaggerating the game's length. In any case, fans can depend on the optional side-missions alone to lengthen the game beyond that of its predecessor. "We have around 15 hours of story that's off the main path," Hill said. "It's completely down to the player when and how they want to tackle this - there's no right or wrong time." We now know Arkham City is longer and bigger than Arkham Asylum. We only have to wait until October to find out if it's actually better.